Koraput: A female doctor landed in controversy after the alleged clicking of a selfie in an operation theatre (OT) at a government hospital and circulating it on social media. The district administration has ordered a probe on a doctor and as per the findings of the probe, further action will be taken. According to the report, a pregnant woman was rushed to the District Headquarters Hospital (DHH) at Jeypore for the delivery. 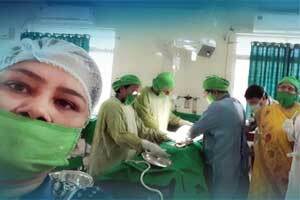 A selfie was clicked inside the OT by a female doctor with a team of doctors conducting an operation in the background. The selfie was later uploaded on DHH WhatsApp group. As the selfie went viral, the health administration drew flacks from different health quarters. After getting the inquiry report, necessary action will be taken, he further added. “We were excited as operation started in the new DHH building and the photo was uploaded in out DHH WhatsApp group. I don’t know how it got leaked to other groups and circulated in social media,” she further confirmed. HOW IS IT ILLEGAL? THOUSANDS OF PHOTO AND VIDEO OF OPERATION THEATRE ARE UPLOADED AND TELECAST IN ELECTRONIC NEWS MEDIA. The CDMO should at the most call her and tell her not to make it viral while taking a photograph is not an offence. We all may be doing that for presentation in various forums. While we take permissions in some, we do not do that in many. As long as we do not show the identity, I have felt it is OK. The CMO seems to be a moron. We doctors take photos and videos of patients especially laparoscopic procedures and rare and unusual cases. And all these are done with prior permission and consent from the patients or their guardians in case of minors. Much ado about nothing. Nobody has been harmed during the taking of the selfie. The activist has obtained instant fame. The govt has received free publicity. The medical profession can be freely abused . …..into such a land my father let my country awake!